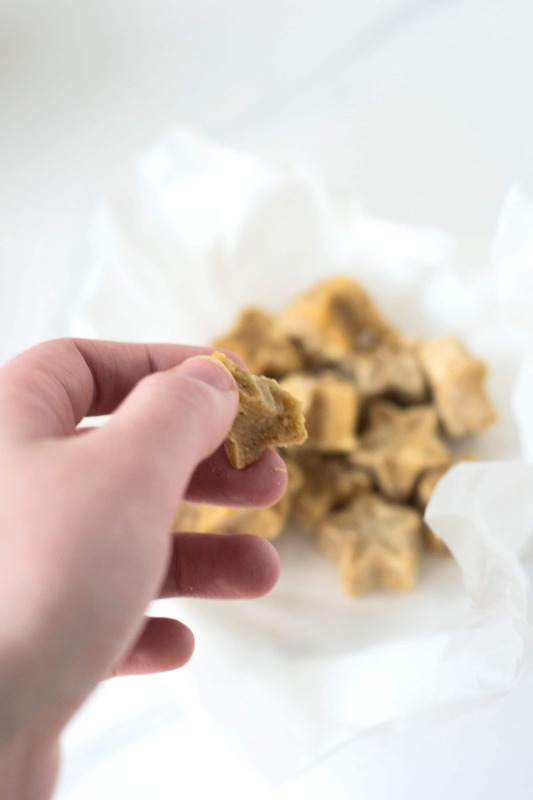 I was curious to see if I could make some hard candy using just maple syrup, so I did some experimenting and ended up with something much softer, creamier and crumblier – fudge! 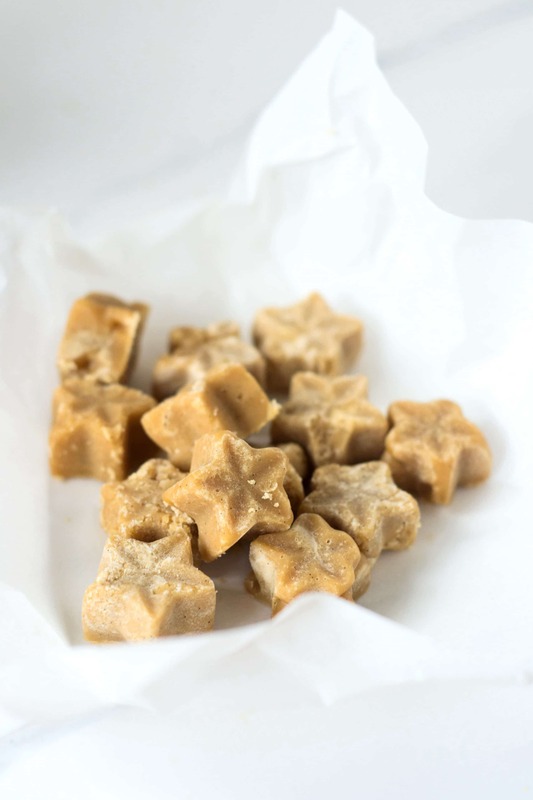 When boiled, cooled and whipped, the maple syrup turns soft and creamy, resulting in a melt-in-your-mouth fudge candy. 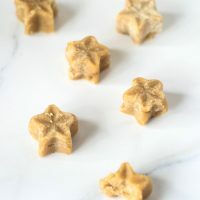 The dark sweetness and subtle maple flavour makes this a unique but familiar tasting candy that is super easy to make, uses only 2 ingredients and is vegan-friendly too! 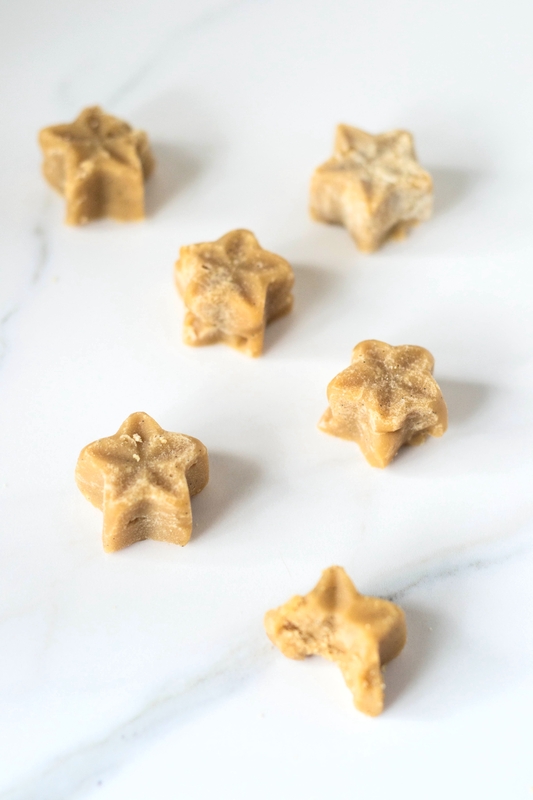 The fudge mixture isn’t particularly easy to use with molds, and so my star shapes came out a little “battered” looking. But it didn’t matter because they were soon all eaten anyway! But if you’re making this for a gift, I would recommend a clean shaped mold without engravings or mold into a large slab and cut into squares. Pour the maple syrup into a medium saucepan and bring to the boil, stirring occasionally. Use a candy thermometer to read the temperature, letting it boil until it reaches 110c / 235f. Once it reaches this temperature, remove from the heat. Let the pot cool to 80c / 175f, without stirring. Then stir the mixture rapidly with a wooden spoon or spatula. Keep stirring and after about 5 minutes, the mixture will thicken, lighten and become creamy. Stir in the vanilla. Once it's thickened and the colour looks like a golden fudge colour, work quickly to transfer the mixture into your molds, as it will set fast. Leave the fudge in the molds to cool completely before removing. Keep the fudge in an air tight tin for up to 1 month at room temperature. Enjoy! I made these last night for a girls night christmas party. I used silicone snowflake molds and put them in the freezer to harder and then push out. They came out great with all the snowflake markings. Thanks for the great recipe! Hey, I would love to try these but it's hard to get hold of real maple syrup around here (in north England), do you think it might work with honey at all? Looks amazing! it's pretty hard to get hold of, I admit. And when you do find it, it's SO expensive :-( Shame, because it's my favourite sweetener. Anyway, I haven't tried it with other sweeteners so I'm not sure. I think it would have a different texture but I'm sure it would still be lovely. Let me know if you try it! Hi, I tried this but after a lot (8 minutes) of beating my syrup still hadn't changed colour. I used a sugar thermometer. What can have gone wrong? Sorry to hear this, did it not lighten or thicken at all? I've never had that happen. My only suggestion would be to try increasing the heat. Let me know if you try it again! Sorry it didn't work out for you. These maple and fudgy twinkies are simply adorable….and I wanna eat them all. You are the queen of awesome vegan desserts, Aimée! How cool, I love how it's just two ingredients. I love the star moulds too, where did you get them from? Looks great to me and sounds easy and delicious, Aimee. I am amazed by all the delicious vegan we're learning about now. 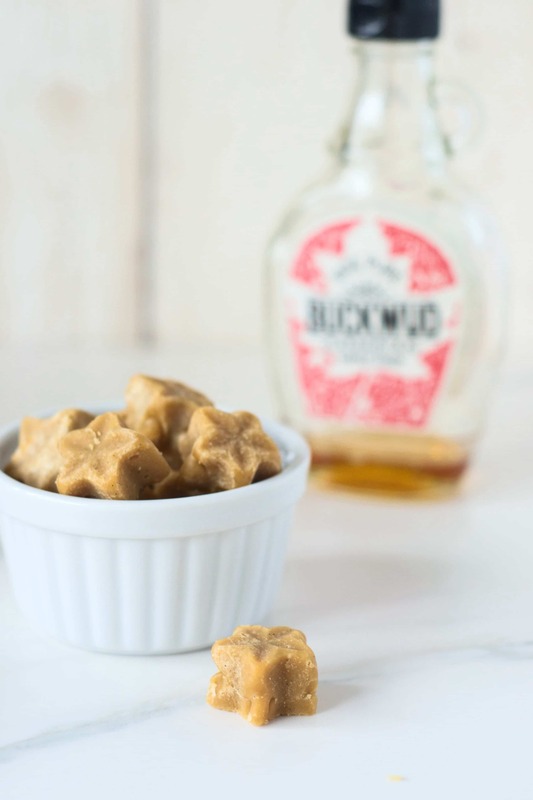 I love fudge and this one sounds awesome since it's only 2 ingredients! The star shapes are so adorable Aimee! 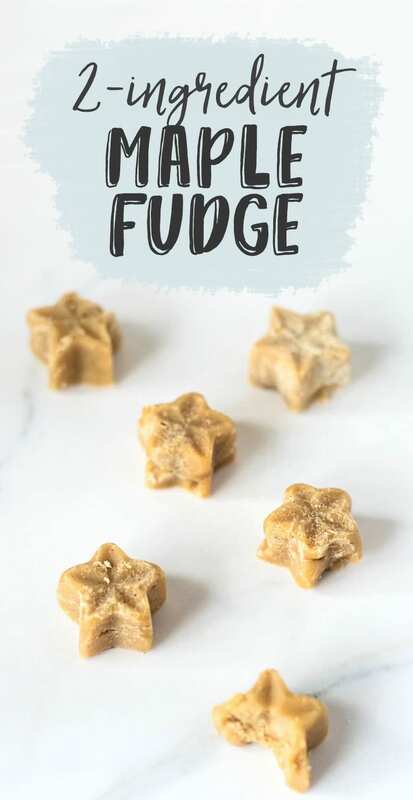 Oh my goodness I love fudge and I love that your recipe is only two ingredients (and two ingredients I always have, at that). The hubs is a maple syrup addict--even puts it on toad-in-the-hole. Toad in the hole? Does it taste good? I can kind of imagine it does! I'm sure it is pretty good--there's really not much difference between the batter for toad-in-the-hole and waffles. I just think it's weird since I usually serve a side salad or cabbage or something like that. Doesn't seem to bother him! 'Battered' stars are much nicer...... 'perfect' is always far too OCD! I can't believe that they are made from just maple syrup & vanilla...... You are a clever stick! im such a fudge lover. My friend is a lover of maple syrup.. might have to make this for us both. love the shape too! It's super easy, hope you get to try it Trisha! What a fantastic idea! I love that this recipe only requires two ingredients, and yet it still produces a fudgy texture. Lovely! I love the texture it makes, it just melts in your mouth. mmm! Oh wow this is adorable looks so cute. Bet it tastes delicious too!